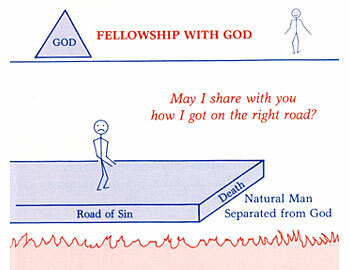 In the beginning, man enjoyed wonderful fellowship with God in a perfect environment. He had peace, joy, and purpose. There was no sin, guilt or death. God told Adam and Eve that they could eat of all the trees in the garden except for one. God told them that if they ever ate of this tree they would die. Some time passed, we don't know how long, and then one day Satan, God's enemy, tempted them to disobey God. They gave in to the temptation and sinned by disobeying God. That day they died spiritually, they were separated from God, and they began to die physically. This was the beginning of sin, guilt, and death in the human race (Genesis 2 & 3).